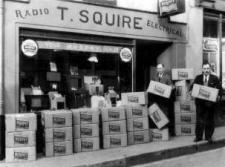 Squires Electrical has been trading in Torrington for over 60 years. We have been providing a friendly family run retail and electrical contracting business, which serves the whole of the North Devon area and beyond. The original shop was started by Tom Squire and then passed onto his son Mike who ran the business until he sold it in 2000.